For three weeks in February, torrents of water rushed down the emergency spillway at Oroville dam, prompting fears that the entire structure would collapse. New images show what’s left of the 3,000-foot long concrete spillway—and the tremendous challenge that now confronts repair crews. 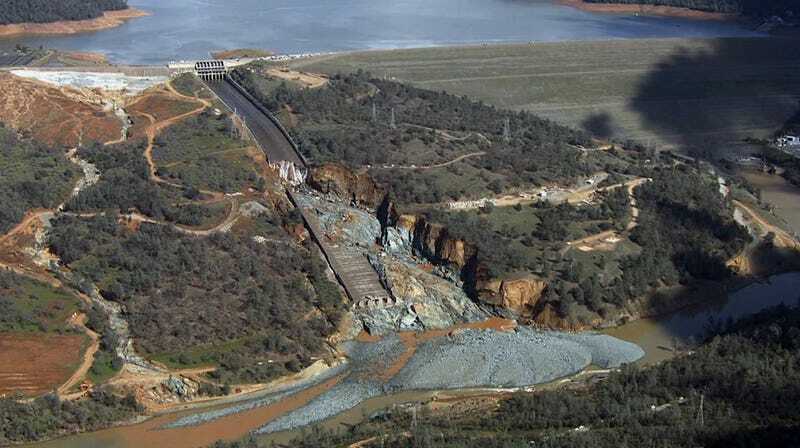 Aerial photos of the Oroville dam show the bottom portion of the spillway completely ripped to shreds, and a dramatic canyon wall with steep cliffs running along side of it. Bits of concrete, rock, mud, and timber lie at the bottom of the structure, clogging the Feather River. Some 188,000 people from Oroville had to be evacuated in mid-February after the spillway showed signs of failure. Weeks of heavy rain prompted officials to release overflowing water from the massive reservoir, but once the flow proved more than the chute could handle, concern emerged that the dam itself might collapse. Mercifully, the structure held. Earlier this week, California’s Department of Water Resources turned off the flow of water, allowing for preliminary inspections of the damaged spillway, and to allow workers to start on what appears to be a monumental cleanup. Once the debris is removed from the lower channels, the DWR can restart flow through the dam itself and switch the hydroelectric plant back on. The hydro plant has been out of action for weeks, removing 819 megawatts of power from the local grid. A small flow of water now trickles down the damaged spillway at the Oroville dam as inspectors investigate. Workers at the top left provide a sense of the enormous scale. (Image: AP). 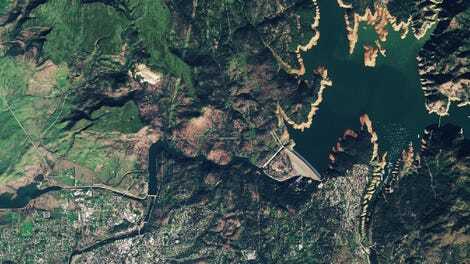 As the new photos show, the damage is quite serious, and concerns remain about the integrity of facility given that there are still five more weeks to go in California’s rainy season—not to mention the billions of gallons of water that will rush to the reservoir once the snowpack in the Sierra Nevada starts to melt. [Engineering consultant Paul Tullis points] to a phenomenon known as “cavitation,” in which the blast of tiny water bubbles gushing down the chute at 50 mph effectively jack-hammered holes in weakened sections of concrete. Others, such as Robb Moss, a professor of geotechnical engineering at Cal Poly San Luis Obispo, speculate that roots from trees growing along the chute expanded weaknesses in the concrete. [David] Rogers, the dam failure expert from Missouri, said the spillway may have had cracks that weren’t properly patched. He also theorized the failure may have been tied to California’s five-year drought: The aging spillway could have weakened as it underwent contractions due to the sudden heavy soaking following years of dry weather. The Federal Energy Regulatory Commission, which licenses the dam, has ordered the state to open an investigation.